Thorstein Bunde Veblen (30 July 1857 – 3 August 1929) was a Norwegian-American sociologist and economist and a leader of the Efficiency Movement, most famous for The Theory of the Leisure Class (1899). [H]ere and now, as always and everywhere, invention is the mother of necessity. Any evolutionary science... is a close-knit body of theory. It is a theory of a process, of an unfolding sequence... of cumulative causation. The great deserts of the evolutionist leaders... lie... in their having shown how this colorless impersonal sequence of cause and effect can be made use of for theory proper, by virtue of its cumulative character. 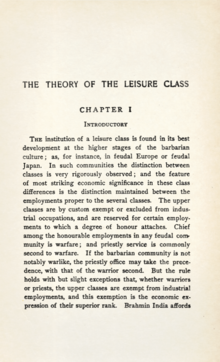 The institution of a leisure class has emerged gradually during the transition from primitive savagery to barbarism; or more precisely, during the transition from a peaceable to a consistently warlike habit of life. In order to stand well in the eyes of the community, it is necessary to come up to a certain, somewhat indefinite, conventional standard of wealth. From the ownership of women the concept of ownership extends itself to include the products of their industry, and so there arises the ownership of things as well as of persons. The possession of wealth confers honor; it is an invidious distinction. However widely, or equally, or "fairly", it may be distributed, no general increase of the community's wealth can make any approach to satiating this need, the ground of which is the desire of every one to excel every one else in the accumulation of goods. While the proximate ground of discrimination may be of another kind, still the pervading principle and abiding test of good breeding is the requirement of a substantial and patent waste of time. The chief use of servants is the evidence they afford of the master's ability to pay. The latter-day outcome of this evolution of an archaic institution, the wife, who was at the outset the drudge and chattel of the man... has become the ceremonial consumer of goods which he produces. But she still quite unmistakably remains his chattel in theory; for the habitual rendering of vicarious leisure and consumption is the abiding mark of the unfree servant. In modern civilized communities... the members of each stratum accept as their ideal of decency the scheme of life in vogue in the next higher stratum. Leisure held the first place at the start, and came to hold a rank very much above wasteful consumption of goods... From that point onward, consumption has gained ground, until, at present, it unquestionably holds the primacy. It frequently happens that an element of the standard of living which set out with being primarily wasteful, ends with becoming, in the apprehension of the consumer, a necessary of life. It is much more difficult to recede from a scale of expenditure once adopted than it is to extend the accustomed scale in response to an accession of wealth. In the rare cases where it occurs, a failure to increase one's visible consumption when the means for an increase are at hand is felt in popular apprehension to call for explanation, and unworthy motives of miserliness are imputed. A standard of living is of the nature of habit. ...it acts almost solely to prevent recession from a scale of conspicuous expenditure that has once become habitual. The need of conspicuous waste... stands ready to absorb any increase in the community's industrial efficiency or output of goods. The domestic life of most classes is relatively shabby, as compared with the éclat of that overt portion of their life that is carried on before the eyes of observers. In the priestly life of all anthropomorphic cults the marks of a vicarious consumption of time are visible. All ritual has a notable tendency to reduce itself to a rehearsal of formulas. There is probably no cult in which ideals of pecuniary merit have not been called in to supplement the ideals of ceremonial adequacy that guide men's conception of what is right in the matter of sacred apparatus. The requirement of conspicuous wastefulness is... present as a constraining norm selectively shaping and sustaining our sense of what is beautiful. In common with other men, the business man is moved by ideals of serviceability and an aspiration to make the way of life easier for his fellows... Motives of this kind detract from business efficiency, and an undue yielding to them on the part of business men is to be deprecated as an infirmity. Still, throughout men's dealings with one another and with the interests of the community there runs a sense of equity, fair dealing, and workmanlike integrity. The machine process pervades the modern life and dominates it in a mechanical sense. Its dominance is seen in the enforcement of precise mechanical measurements and adjustment and the reduction of all manner of things, purposes and acts, necessities, conveniences, and amenities of life, to standard units. Without much preliminary exposition and without feeling himself to be out of touch with his contemporaries, Darwin set to work to explain species in terms of the process out of which they have arisen, rather than out of the prime cause to which the distinction between them may he due. Frank H. Knight and Thorstein Veblen. "The Place of Science in Modern Civilization." (1906): 518-520. A civilization which is dominated by this matter-of-fact insight must prevail against any cultural scheme that lacks this element. This characteristic of western civilization comes to a head in modern science, and finds its highest material expression in the technology of the machine industry. The means whereby this work of Nature is brought to its consummate issue are forces of Nature working under her Laws by the method of cause and effect. The principle, or "law," of causation is a metaphysical postulate; in the sense that such a fact as causation is unproved and unprovable. No man has ever observed a case of causation, as is a commonplace with the latterday psychologists. Habituation to bargaining and to the competitive principles of business necessarily brings it about that pecuniary standards of efficiency invade (contaminate) the sense of workmanship; so that work, workmen, equipment and products come to be rated on a scale of money values, which has only a circuitous and often only a putative relation to their workmanlike efficiency or their serviceability. Those occupations and those aptitudes that yield good returns in terms of price are reputed valuable and commendable, — the accepted test of success, and even of serviceability, being the gains acquired. Workmanship comes to be confused with salesmanship, until tact, effrontery and prevarication have come to serve as a standard of efficiency, and unearned gain is accepted as the measure of productiveness. Born in iniquity and conceived in sin, the spirit of nationalism has never ceased to bend human institutions to the service of dissension and distress. Veblen ... was a masterless, recalcitrant man, and if we must group him somewhere in the American scene, it is with those most recalcitrant Americans, the Wobblies. On the edges of the higher learning, Veblen tried to live like a Wobbly. It was a strange place for such an attempt. The Wobblies were not learned, but they were, like Veblen, masterless men, and the only non-middle class movement of revolt in twentieth-century America. With his acute discontent and shyness of program Veblen was a sort of intellectual Wobbly. 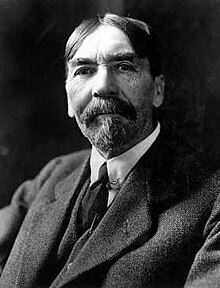 If Veblen failed to develop an evolutionary methodology, he also failed to develop a comprehensive evolutionary theory to explain in detail how institutions evolve in the cultural environment and what sorts of interaction occur between economic activity and institutional structures. Veblen was something of an intellectual butterfly, and he often lacked the patience to elaborate his ideas into a coherent system. But he teemed with fragmentary insights, and these can be pieced together to suggest the outlines of a Veblenian scheme of cultural evolution - what might be called a ‘pre-theory’ of cultural change. This page was last edited on 23 January 2018, at 00:48.